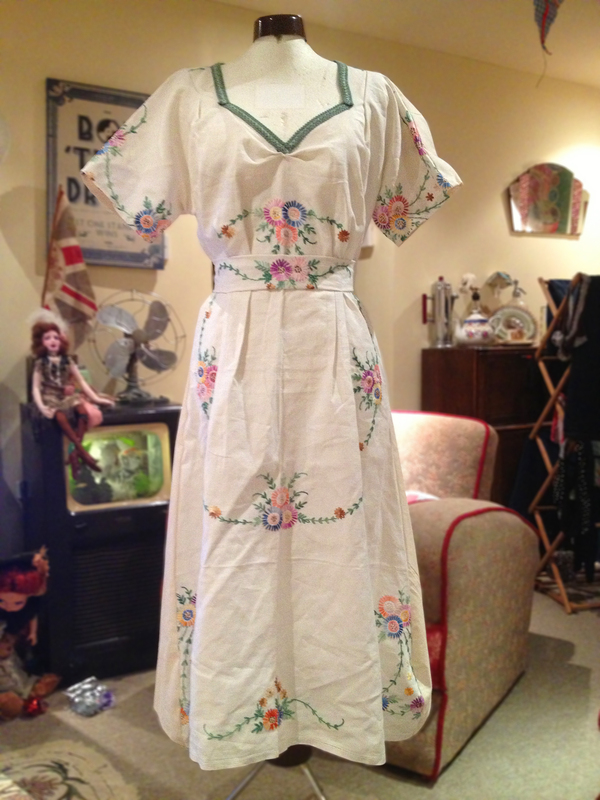 This weekend I decided to make a dress out of my WWII house dress pattern. I wouldn’t usually endeavour to do such a painful sewing task, but this fabulously easy pattern requires no buttons or zips (courtesy of wartime rationing) and is made out of 1 front panel, 1 back panel, a sash belt and optional pockets. I have used this pattern a couple of times before; making a dress and a top, but I felt more confident on this project. 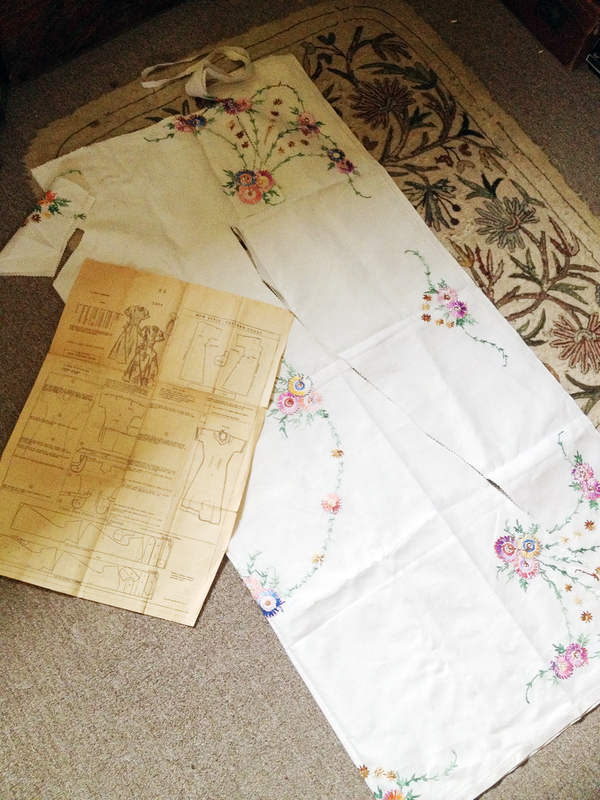 I had bought a beautiful hand embroidered table cloth at a charity shop in Weymouth with the soul intention of creating a dress or top with it. I have a couple of embroidered tablecloths that I adore, but never get to use them for fear of spillage and staining, so like many people, I store them away and they are never admired. Unfortunately I only had enough of the flower embellished Irish linen to do the front of the dress and belt, so took one of the matching serviettes to the local haberdashery shop to match it with plain linen or calico. I did find some great natural calico that matched brilliantly…until I had finished stitching and realised that the tablecloth was in fact a lighter shade than the flipping serviettes! That aside, I am very happy with this pretty summer dress. The back is very plain, with just the floral detailing of the sash belt offering a rainbow speckling of colour, whilst the front is splendid with colour and pattern. I chose not to put the pockets on as they would have covered up some of the beautiful handiwork, but added some green upholstery trim to the neckline to finish it off. Posted in Arts and Crafts, Fashion and Shopping and tagged 1940's house dress, day dress, embroidered tablecloths, kitten von mew, kitty von mew, make do and mend, tablecloth dress, wartime dress, wartime fashion, ww2 dress, ww2 dress patterns, wwii dress, wwii dress patterns. Bookmark the permalink.